TWO TABLETS PER DAY WITH A MAIN MEAL. Swallow with water or a cold drink. Not to be chewed. Do not exceed the recommended intake. 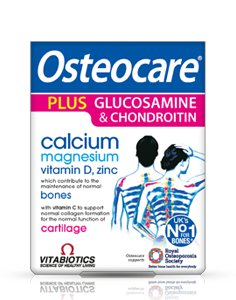 Osteocare can be continued for as long as required and can be taken with other products in the Vitabiotics range. As with other food supplements, seek professional advice before using if you suffer from food allergies, or are allergic to any of the ingredients. Food supplements must not replace a varied and balanced diet and a healthy lifestyle. Store below 25°C in a dry place, out of sight and reach of children. Why has Osteocare been developed? What do I need to know before starting to use Osteocare ? Can Osteocare be used simultaneously with medications? How and when should Osteocare be used? How many tablets and capsules does Osteocare contain? Are there any undesired effects whilst taking Osteocare? For those people who experience difficulty swallowing tablets, are there any tips or recommendations to help ease swallowing Osteocare tablets? What is the source of calcium used in Osteocare ? Can calcium supplements like Osteocare cause kidney stones? Are Osteocare tablets absorbed by the body as quickly as the liquid version? 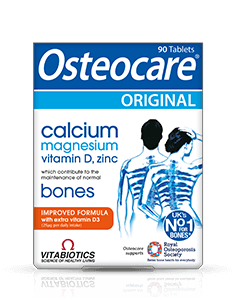 Is Osteocare recommended with any other Vitabiotics product(s)? Osteocare is scientifically formulated, and developed by experts, and each ingredient is included on the basis of research evidence. Bone is living tissue and to help keep it healthy, you must have the right nutrients in your daily diet. Calcium contributes to the maintenance of normal bone health, along with vitamin D which contributes to normal absorption and utilisation of calcium in the body. Zinc and magnesium are also essential factors in normal bone health and unfortunately, many people, especially those cutting down on their dairy products, may not be getting all the calcium they need. Osteocare is formulated for long-term use and can be taken for as long as required, and is also approved by The Vegetarian Society. 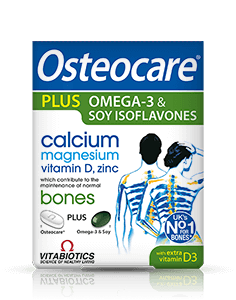 Osteocare is a calcium combination supplement, specially formulated as a daily nutritional safeguard for men and women of all ages. Generally, Osteocare can be taken alongside medications because it contains only moderate levels of minerals and vitamin D. For specific advice on taking Osteocare with medicines, we recommend that you contact your doctor or pharmacist first. Osteocare is available in both tablet, chewable tablet and liquid form. The liquid version is ideal for those who have difficulty swallowing tablets, and for younger children and infants over six months of age. Osteocare tablets - Two tablets daily (or one tablet twice daily) is recommended before or with meals, with water or a cold drink. Swallow without chewing. Always ensure that Osteocare is taken with plenty of liquid to wash down the tablet. We do not recommend chewing the tablets because they have not been formulated as chewable preparations. Chewable tablets usually include flavourings, sweeteners and/or added ingredients to help break the tablet up in the mouth. 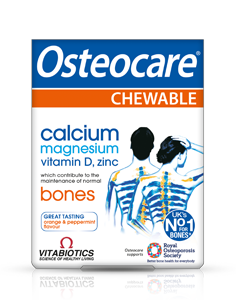 For a chewable tablet, please see Osteocare Chewable. Osteocare is available in 30 tablet and 90 tablet packs. It is recommended to take two tablets per day. Osteocare has no known side effects when taken as directed. Do not exceed the recommended intake. In general calcium supplement tablets do tend to be larger than other pharmaceutical preparations. The Osteocare tablets have been specially designed with an oval, streamlined, easy to swallow shape. However, if you do have difficulty swallowing, the same formula is available in a chewable tablet form. 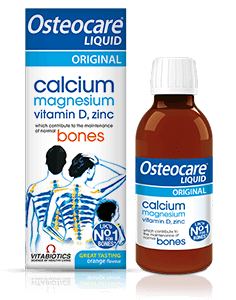 Osteocare is also available in a pleasant smooth, orange tasting liquid form. The calcium in Osteocare is in the form of calcium carbonate, which provides the highest concentration of elemental calcium possible in a supplement. This means that Osteocare can provide the full NRV of calcium and other minerals without the need to take lots of tablets. The calcium carbonate used is of high pharmaceutical grade from a natural source. To prevent possible contamination with metals such as lead, oyster calcium and bone-dolomite have not been included in the Osteocare formulation. It is important to select a calcium supplement such as Osteocare , which includes calcium in combination with other synergistic co-factors such as magnesium. The presence of the mineral magnesium, as well as contributing to the maintenance of normal bones, also contributes to normal protein synthesis and electrolyte balance. Osteocare tablets are tested to ensure the correct disintegration and dissolution profiles. Strict pharmaceutical disintegration tests, under the same comparative acidic conditions of the stomach, have shown the tablets to disintegrate between 6 to 15 mins (on average). Once the tablets have disintegrated the nutrients in tablet form will be absorbed at approximately the same rate as the liquid version. 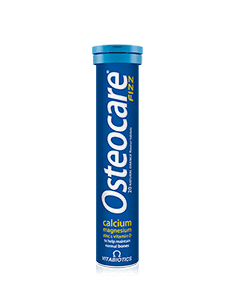 Osteocare has been carefully formulated so that it can be used in combination with any other product in Vitabiotics multivitamin and mineral product range, or other food supplements such as garlic, fish oil etc. However, for maximum results we recommend Osteocare is taken at a separate time of the day, at least an hour apart from your main Vitabiotics multivitamin supplement.